She Is Ambitious, Science Driven And Is A Great Addition To The Team - Meet Ashley! 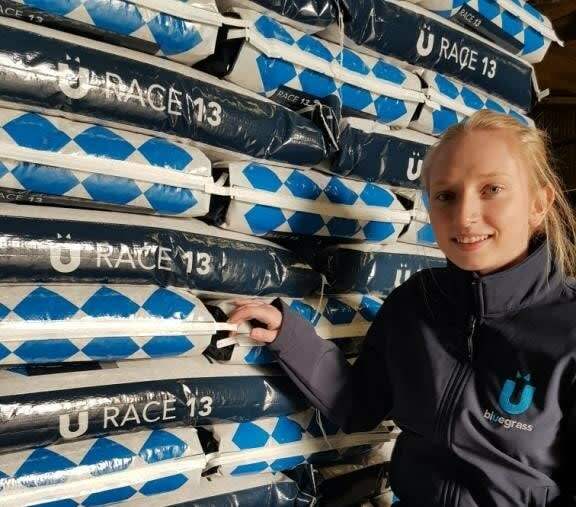 HERE at Bluegrass Horse Feeds we are very proud of our team so we want to introduce our customers and merchants to the people who work so hard to ensure you get the horse feed which best suits your horses' performance. First up - meet Ashley Neely. WHERE ARE YOU FROM: Fivemiletown in Co Tyrone. WHAT ABOUT SCHOOL: I attended Fivemiletown College where I studied GCSEs. Then I went to Cafre in Enniskillen for a Level Three Extended Diploma in Horse Care. I then went to Reaseheath University in Cheshire to study Bachelor of Science in Equine Science. I was the most successful graduate out of that year so achieved their graduate profile which was a really cool thing to have achieved. I graduated in 2015 with a BSc. WHAT DID YOU DO NEXT: I moved home and taught in pony clubs and then I decided to start up my own business which is called EFEC - mobile equine and agriculture worm egg counts (you'll find me on Facebook). Essentially what I do is I travel to yards all over Ireland to do on site testing to see if your horse has worms. I adopt a targeted worming approach so that you only worm your horse when worming is needed. I am an SQP (Suitably Qualified Person). I am a veterinary medicine advisor which means I am licensed to legally advise on wormers. ARE YOU BUSY: From November through to March time my business doesn't run because worms either die or hide in the gut. It's a nice natural break for me but I have so many other things to do so I am kept really busy. WHAT DO YOU DO AT BLUEGRASS: I am the Sales and Marketing Administrator. Bluegrass is such a great company to work for and we have sales orders coming in from all over. Part of my role involves dealing with the orders which come through, offering nutritional advice to customers either when they phone or email in. I also offer advice on the different range of products we have and the nutritional aspects of those products. This is one element of the job which I love. There are not too many companies out there which can deliver such a personable approach. We believe it's always important to be accessible for our customers and ensure they have the right feed for their horses. Bluegrass is a science led company and I too add to that with my science background. BEST PART OF YOUR JOB: I'm so happy to be working with a team which is consistently building on the approachability of the company. We are Ireland's official Kentucky Equine Research (KER) partner so to be in a position to speak directly to customers and pass on vital research and nutritional advice on our products is a great feeling. It's important to us that we can continue to offer a science drive approach to customer service. WHAT ARE YOUR HOBBIES: Horses. I have four of them. They are all obviously #PoweredByBluegrass as we say. One of my horses is an eventer. I used to compete before going to university. He's is fed on Relieve. He's called Cecil, he's a Connemara and is about seven years old, 15.2 hands but he's a pony at heart. YOU ARE VERY AMBITIOUS. DO YOU HAVE ANY TIPS FOR YOUNG PEOPLE? Education is everything. The more qualifications and experience you have the better. I found it vital to build up my CV from as soon as I left school. If you know you want to work in the equine sector don't be afraid to do the jobs in the yards. Get your experience. I still teach pony clubs because that's important to me and is great grounding. Be confident about who you are and your capabilities and other people will see that in you. WHAT ABOUT PET HATES: I really don't like being disorganised. I am always organised. Also I can't stand bad time keeping. WHAT ARE YOUR PERSONAL AMBITIONS FOR THE FUTURE? I would love to achieve my Research Masters in the next couple of years. It's going to be a Research Masters combined with my business - EFEC. How cool would that be? So, yes, I want to get that done.